00:55:00 Makes 4 servings, 1/4 recipe (461 g) each. Makes 4 servings, 1/4 recipe (461 g) each. This is what happens when a good ol’ chicken casserole gets a boost of flavour from cilantro, salsa and Tex Mex cheese. 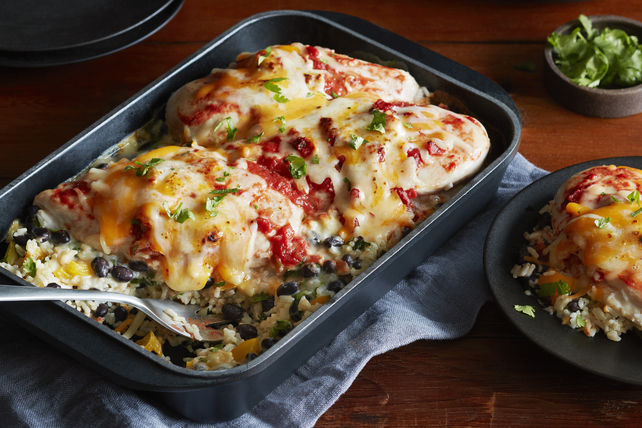 You get an easy baked chicken dish with cheesy rice and a spicy kick. Combine rice, beans and peppers in 13x9-inch baking dish. Mix soup, water and cilantro; pour over rice mixture. Top with chicken and salsa. Bake 35 min. or until chicken is done (170ºF). Top with cheese; bake 10 min. or until melted. Don't have fresh cilantro? Use 1 tsp. ground coriander instead. Serving Size Makes 4 servings, 1/4 recipe (461 g) each.